I apologise for being missing in action for the last few months, but I have finally surfaced with six blocks that I hope will pass scrutiny. We travelled to Holland (from England) and back last weekend, which involved 7 hours each way on a ferry, so I cut the blocks before I left and had a very enjoyable trip hand stitching them. I hope that my hand stitching is OK to enter. 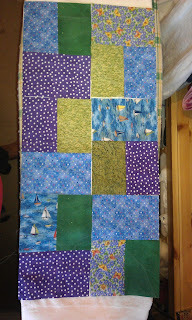 Hand stitched blocks are OK and hand piecing sounds like the perfect activity for the ferry. I've added your blocks to the list. With a new total-so-far of 374 blocks, yes, we do have enough for EIGHT WINNERS. What a treat it ill be for someone to win these blocks. They carry quite a story.